Many agents turn to social media for real estate lead generation, and for good reason. More than 2.03 billion people in the world use social media, and a good bit of their purchasing decisions are being driven by what they see and learn there. But successfully connecting with potential real estate clients via social media can be challenging. Although the real estate industry boasts the highest frequency of posts per week, it experienced the lowest level of engagement, according to HubSpot’s 2015 Social Media Benchmarks Report. Bottom line: You’re trying to connect with clients, but they just aren’t very receptive. Make your efforts worth it by following these tips from people who have successfully used social media as a tool for real estate lead generation. “Oftentimes, new agents may leverage their brokerage website. While having your own page and personal profile on that website is important because it gives you additional search real estate, owning your own ‘.com’ with your name (e.g., JaneDoe.com) further raises your profile in search engines,” says Aalap Shah, co-founder of SoMe Connect, a Chicago-based marketing agency that works with real estate agents. Adds Ariel Mordetsky, founder of real estate website Cruvita.com, “Whether you are using Facebook, Twitter, LinkedIn, and so on, make sure there are clean and distinct links back to your website,” so that your brand is continuously reinforced. Owning your own domain is an important first step on the road to successful real estate lead generation. Just ensure that your website is professional-looking and user friendly. Getting them there is only half the battle. Keeping them there requires a sophisticated site loaded with valuable information. Want to hear something a little sad? 70 percent of your clients will forget you after just one year. That’s why you have to make them remember you. Even if they won’t necessarily be in the market again for a while, you can’t forget about them either. Word of mouth promotion is still the best way to land new real estate clients, and past clients will eventually know someone who needs a great agent. When that time comes, you want them to remember your name. “It seems like everyone knows at least five real estate agents, so staying relevant and top of mind is always a goal,” says Stacy Doherty, a realtor with Coldwell Banker in Canton, MA. Provide your followers with content they actually want to read, including news about the neighborhood, DIY posts, home maintenance, and so on. You’ll stay on their minds, and they will be more likely to refer you to others. Social media was designed for networking. When using social media for real estate lead generation, take the time to build connections. Identify the influencers in your area, whether that includes a local public school system, newspaper, or five-star restaurant. Follow those influencers and share their content. This will encourage them to reciprocate. When someone shares your content, remember to repay the favor. That’s how you gain exposure, followers, and potential real estate leads. “When someone retweets and supports me, it’s just natural for me to want to share, retweet and show my gratitude. As a result, I recently met a mortgage lender on Twitter. We took our virtual relationship to reality, and I hope to refer a buyer to him soon,” says Debbi DiMaggio, realtor, author, and cofounder of Highland Partners. Sometimes you have to provide followers with just a taste so that they want more, says Jeff Knox, the broker owner of Knox & Associates Real Estate Brokerage. “I place a landing page advertisement on Facebook for a listing and include photos. I don’t give away many details about the property, but I include a ‘Learn more’ button. When potential clients click the button, they are taken to a property landing page on my website with a large image of the property in the background and a registration form overlay. They must register to see the listing details of the property. I spend approximately $10 per day on the advertisement and receive one to three new registrations each day,” he says. Using social media as a tool for real estate lead generation can be tricky, but it offers a lot of potential. 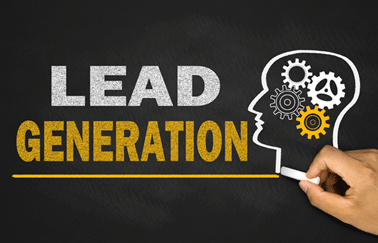 Use the above tactics to up your game and start generating solid leads through your social networks. For more real estate lead generation tips, check out our previous posts: 5 Real Estate Prospecting Plays for New Agents and Beginner’s Guide to Real Estate Marketing. Not licensed yet? Earn your real estate license online at Real Estate Express.